: Solanum xanthocarpum is a very common herb in India. It is found almost in every part of India. This herb is also found in South East Asia and Australia. Kantakari is a very useful Ayurvedic herb, used widely in the treatment of cough, cold, asthma and such other respiratory tract conditions. It is one among Dashamoola – group of ten roots. olanum xanthocarpum (Solanaceae) has been used for treatment of many infectious and degenerative diseases in traditional medicine. 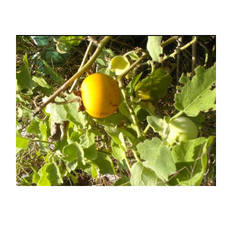 Present study reports the medicinal efficacy of S. xanthocarpum fruit as antioxidant, anticancer and anti HIV agents. Usages: Asthma, Bronchitis and Cough. 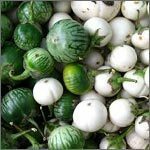 Solanum virginianum, also called Surattense nightshade, yellow-fruit nightshade, yellow-berried nightshade, Thai green eggplant, Thai striped eggplant, is also known as Indian night shade or yellow berried night shade plant, the common name is Kantakari, Solanumsurattense Brum. Kantkari, botanically known as Solanum Xanthocarpum, is a very spiny diffused herb, with a height of up to 1.2 meters. The young branches are densely covered with minute star-shaped hair, while the mature branches are zigzag, covered with yellow, sharp shining prickles and spread close to the ground.